NEARLY 80 creative students currently studying the pre-degree UAL Foundation Diploma in Art and Design at Weston College have been given a square foot of space in a Bristol gallery, to showcase their multiple talents. 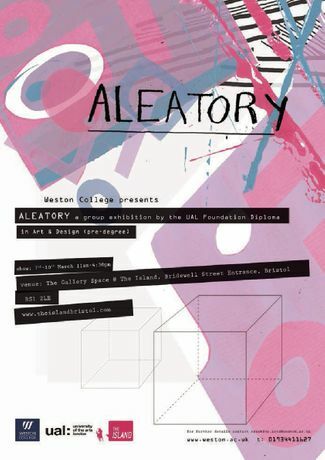 ‘Aleatory’ is the unusual name of the exhibition, which is set to be held at The Island in Bridewell Street between March 6 th and 10 th from 11am – 4.30pm. Join the students and staff for the Preview Night from 6 until 9pm on Tuesday March 6th . definition is to rely on chance or an uncontrolled element in the creation of art. Join the Facebook event, click here.